missed doing the February week 1 sketch for Viva la Verve. I am also entering this card into the Spring Coffee Lovers Bloghop. Thanks Karen! It wasn't too bad! He had a hard time getting one numb so he had to use a more powerful numbing shot that tasted gross, but at least it's over with! :-) Both my cavities were in my wisdom teeth, I guess that's what I get for not letting him pull them years ago... lol! Wow such a wonderful card and a great take on the sketch love, love it. Beautiful color combination! Love it! Love your tag card, Hillary, so many pretty layers! Happy Wednesday and happy hopping! Gorgeous card! My favourite colour of pink! Love the sketch you used! So pretty, love all the pink and black! Love the pink and black and the awesome tag. Great colors for a Spring coffee card! So lovely, and I just noticed your enabler's list. So funny! What a pretty card! I just love the patterned papers you used! So so sweet...love the look of black and pink you are tag is just adorable. Super cute, perfect take on the sketch. i like your work, I'm a new follower of yours! Thanks AJ! I followed you too! Beautiful card! I love how you used the sketch and those wonderful papers! I hope your teeth are feeling better by now. 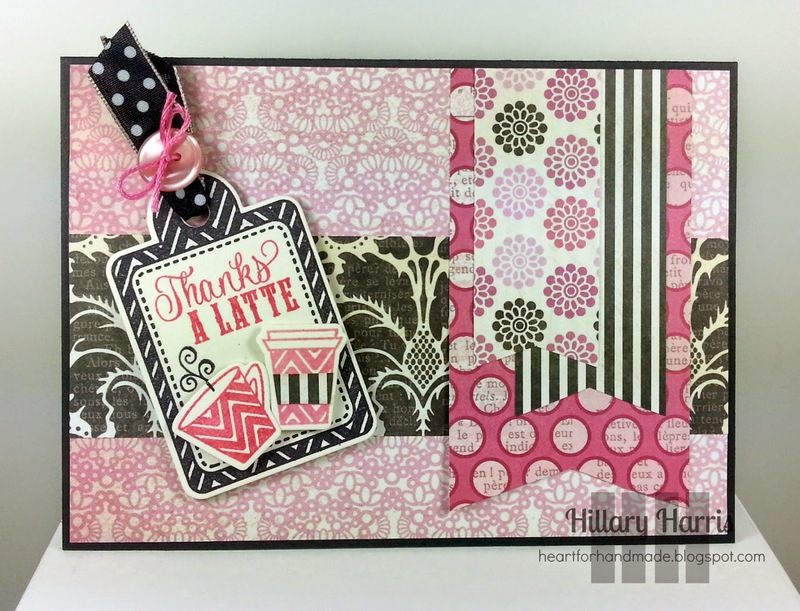 Fab colors, tag and card! Fabulous combo of patterns and colours! Love all the different patterned papers. Aww- dentists. Hope it wasn't too bad. Another really lovely card!